Even though this book is a few years old, I was thankful a friend passed it along for me to read. I’ve read a couple other books this past year from the Barna camp, unChristian and Pagan Christianity, and while I haven’t subscribed to every thought presented, I have appreciated the discussion they’ve brought to the table. The Revolution Barna is exploring is one where many modern Christians are leaving organized church in search of a more authentic faith expression and community. Beyond a commentary on this trend, I really appreciated the way he took the opportunity to encourage readers to lean into their beliefs and live out their faith in a real and tangible way. Ultimately the Revolution is about followers of Christ genuinely living a life that is honoring to Jesus, inside or outside of the local church. A strong argument and reason that many people are expressing in leaving the local church as their connection to faith, is that the current church can be ineffective in it’s efforts. Beyond programs and consumer driven services, these Revolutionaries are seeking a faith and community that has genuine transformational impact on their lives and relationships. The book is a fairly quick and easy read. If you’re someone exploring how your faith is really working in the real world, this book could be a good read for you. World renowned pollster George Barna has the numbers, and they indicate a revolution is already taking place within the Church, one that will impact every believer in America. Committed, bornagain Christians are exiting the established church in massive numbers. Why are they leaving? Where are they going? And what does this mean for the future of the Church? 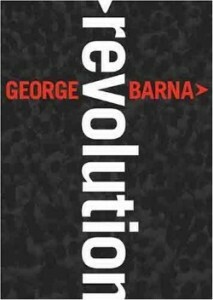 Using years’ worth of research data, and adhering to an unwavering biblical perspective, Barna predicts how this revolution will impact the organized church, how Christ’s body of believers should react, and how individuals who are considering leaving (or those who have already left) can respond. For leaders working for positive change in the church and for believers struggling to find a spiritual community and worship experience that resonates, Revolution is here. Are you ready?